​​If you are like me, whenever a special day like Valentine’s Day comes around I usually search Pinterest or Google for unique gift ideas for my husband. Guys can be difficult to shop for sometimes! After doing some searching I put together a list of unique gift ideas for husbands, specifically to help wives like me who need a little help in the planning department. Hopefully, this list encourages you and sparks some neat ways you can bless your husband this year! **Bonus: If you are looking for a special gift for yourself that will positively impact your marriage…my book The Unveiled Wife is available! Click HERE for details! This is a great gift idea for the husband who loves to relax in luxury. Turn his bath into a spa! These 12 bath fizzies are made with shea and coco butter to moisturize dry skin. Organic ingredients and unscented makes this a thoughtful gift for a man who is sensitive to aromas and other harsh ingredients. This elixir conditions beard and mustache hair throughout the day and includes a wooden comb. Fill your man’s heart by filling his stomach with some of the manliest snacks you can find on the market. This snack kit is filled with delicious manly treats full of nuts, protein, and best of all, MEAT! 4. Burt’s Bees Natural Skin CareThis gift set contains 5 natural skin care products for men including Shave Cream, Aftershave, Body Wash, Hand Salve and Lip Balm Beeswax all made with natural ingredients. Does your husband like to fidget with spinners? Maybe he will get a kick out of having a different style attached to his keys! This is a less expensive, and fun gift idea. This is a funny and cute gift to let your husband and everyone else know how awesome he is! My husband and I have both been through this devotional and highly recommend it. This book will be an incredible source of inspiration and encouragement for your man’s walk with God. Designed by a Military fitness expert, this bodyweight exercise workout game includes video instruction. There is no equipment needed. These Christian marriage devotionals/prayer journals were written for the husband who wants to experience a deeper relationship with their spouse AND with God. These powerful resources lead men to gain a better understanding of their role as a husband and spiritual head of their home. Maximum 900 Lumens output, convenient dual side mode and power switch to enable easy access to five brightness, strobe SOS, and subcompact size that fits in palm or pocket makes this an awesome guy gift. My husband has a similar one and he uses it every day! This 3D wooden brain teaser is a unique gift for the guy that likes a challenge! Have fun with this puzzle and see who can figure it out the fastest. This is a 21 piece travel toolkit, including faux leather case, 10 screw bits, bit driver, mini-slotted, mini-philips, extension, pliers, 3 ft measuring tape and 4 sockets. With a secure fit and reinforced sole, these socks are really comfortable. My husband has been wearing them and loves them. They are also great for guys who have sweaty feet. Just like the husband and wife devotionals, this set is a perfect gift. Thirty-One Prayers For My Husband/Wife is discounted if you buy them as a book bundle! Take advantage of this deal and pray for your marriage together. If your husband is a suit and tie kind of guy, this would be a great gift to bless him with.This set includes 3 silky-feeling imported 60” neckties, pocket handkerchief, plus 4 tie clips, + 4 matching cufflinks. Cold brewing is 70% less acidic than hot brewing and richer in taste. So, if your husband is a coffee enthusiast get him a gift you know he will appreciate. This can also be used in brewing iced tea. This is a very thoughtful way of simply saying “I Love You!” for Valentine’s Day. And it is a very memorable gift. Complete outdoor barbecue grilling accessories kit includes 4-in-1 spatula, fork, superior-grip tongs, silicone basting brush, 4 kabob skewers, 8 corn holders, salt & pepper shaker, grill cleaning brush all in an aluminum storage case. With 3 zoomable settings and 1000 lumens, this headlamp is awesome! It also comes with rechargeable batteries. Inexpensive and personal makes this a great gift to give your husband. It measures at 4.5″ when closed. This is a gift for both him and you! And this shirt is available through my online store! Nontoxic and BPA free, this bottle has double-wall vacuum insulated TempShield technology and liquids remain hot up to 6 Hours, and cold up to 24 Hours! Designed to make your husband’s shaving experience even easier, this razor features a single piece razor that twists to open the butterfly top. Fit the razor blade inside and twist to close. Men love meat. This book is the Bible of meat as it goes through all the different varieties and explains them in depth. If your husband loves meat, orders it at every meal, and would choose steak over cupcakes you need to get him this book! If your husband appreciates genuine, handmade leather bags this would be a great gift for him. This is a bag that helps store all of your husbands toiletries while traveling. This bag will endure travel wear and was made to last. Get a print of your husband’s favorite ballpark! These are 18 x 24 inches and printed on museum quality paper. Get a keychain personalized with the latitude and longitude of a special place for you two, such as where you got married! This is a thoughtful gift that will keep a special message from you to your husband with him at all times. My husband has a similar slim wallet and loves it! Well there you have it…29 unique Valentine’s Day gifts for your husband. 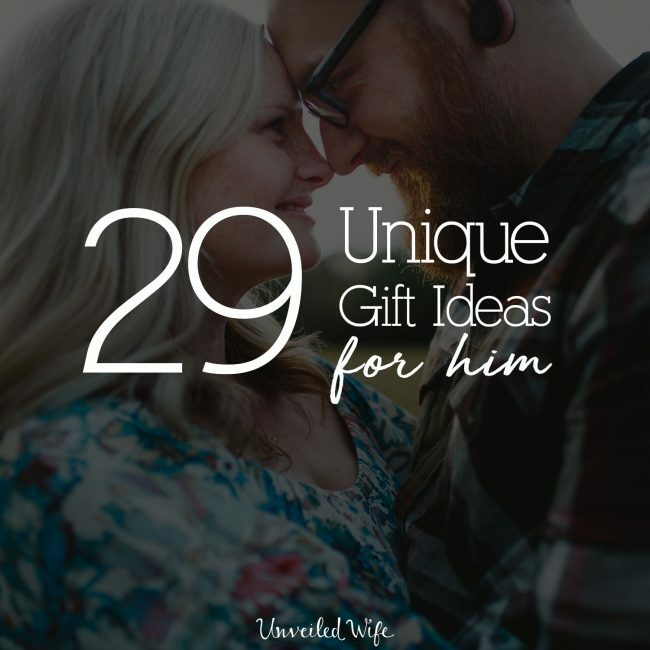 I hope this list helps you find the perfect gift for your husband as you look for a special way to bless him. Valentine’s Day is a time that we are motivated to lavish our love on our husbands, but sharing gifts can happen all year long! So tuck this list away somewhere memorable and use it for any time you desire to bless your husband. I hope it helps!